Open application programming interface (API) banking and immediate payments are a perfect storm for new banking, according to FIS. Established payment systems do not work in the way most consumers and businesses expect in a digital, mobile, real time world. Consumers expect instant gratification; digital money should act more like physical cash in terms of speed and ease than a funds transfer. Banks will have to rethink their roles in order to serve their customers in this environment, bearing in mind that customer loyalty is a thing of the past; if banks do not develop the services customers want, those customers will go elsewhere. What does this mean for banks’ infrastructures? Banks can approach this from a legacy point of view or can use the changing requirements as a reason to reassess systems. Real time payments will mean a significant increase in hits on banks systems and every transaction that comes in must be validated, requiring other systems to be interrogated. One bank FIS was advising calculated that migration from batch to real-time payments processing could require tens of millions of dollars extra to be spent on support of those payments. “Banks need to think about how they can deploy systems that will allow them not to have to spend that sort of money and also to take the load off systems,” he said. Richard Chapman, vice-president and functional head of reconciliations at FIS, said in searching online about the benefits of faster payments and API banking one group was conspicuous by its absence: banks. 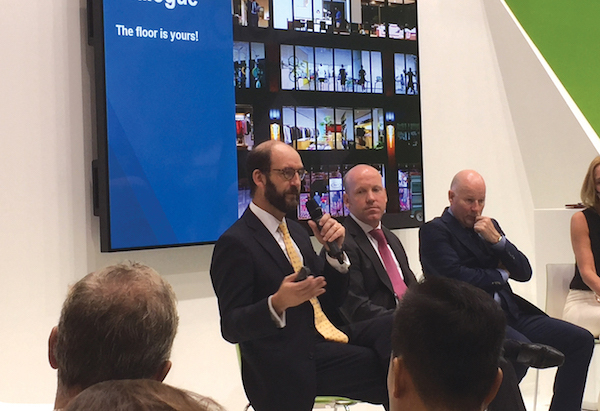 “We have heard a lot at Sibos about how banks have to adapt to the new world and create new revenue streams for their business,” he said. FIS reminded delegates that in the instant world, you need to provide context in order to drive revenues, reduce costs and increase efficiency. Faster payments without data or context is just less slow payments; open APIs without context or data is confusion. Andy Schmidt, senior analyst at CEB Towergroup, reminded the audience that customer loyalty among corporates is a thing of the past. The share of the corporate wallet is being spread across many more banks. While relationships remain important to corporates, being able to deliver innovative products and services to meet their needs – and that will evolve with them – also matters.